Students around the country protested neo-fascist speakers this spring. Charles Murray, author of The Bell Curve that promotes the spurious theory that Blacks are inferior to whites, was a popular target. At Middlebury University in Connecticut, he was met by an angry crowd that prevented him from speaking. As he left, students rocked his car. The University is considering disciplinary action against students involved in the protest. Despite a petition signed by thousands of students and faculty, Mike Pence was allowed to give the commencement speech at the University of Notre Dame. Hundreds of students turned their backs as he spoke. 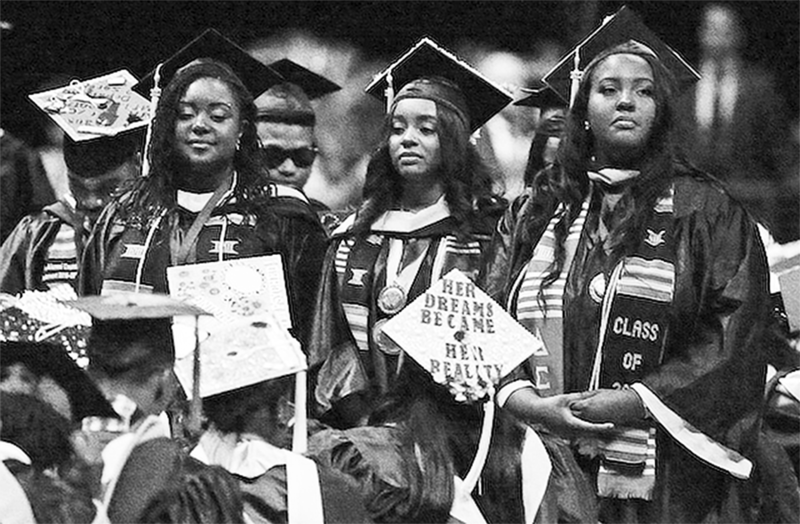 They marched out in protest, then held an alternative graduation in a near-by park. Another neo-fascist masquerading as a conservative, Heather MacDonald, was scheduled to speak at Claremont-McKenna University in California but a loud and vocal crowd of protesters forced her off campus. She authored a book arguing that the police are in danger of being killed by civilians, not the other way around. Bethune-Cookman University graduates turning their backs during commencement remarks by Betsy DeVos on May 10, 2017 (Screenshot taken from Twitter by Colorlines). Students took up other issues as well. Hundreds of students at the University of California at Santa Barbara staged a sit-in at the office of the Chancellor, Henry Yang, demanding the university divest from fossil fuels. In a victory for the students, Yang agreed to advocate for divestment. Hundreds of students at New York’s Stony Brook University held sit-ins and demonstrations in early May to protest budget cuts that would especially affect Latinx students. The administration proposed cutting $1.5 million from the budget of the Humanities and Language Departments. In mid-May, students at Northwestern University drove out an agent of the infamous ICE (Immigration and Customs Enforcement) who had been invited to speak on campus. The Chicano student group MEChA (Movimiento Estudiantil Chicanx de Aztlán) denounced the agent’s appearance as “irresponsible” and said that they would not have any dialogue with an agent of such an agency. Students swarmed into the classroom where the agent was scheduled to speak with a banner that said “No More Deportations.” The agent left quickly. The University is threatening disciplinary action, although as of now none has been taken. This entry was posted in Articles and tagged African Americans, Bethune-Cookman University, Betsy DeVos, Black liberation, Charles Murray, Claremont-McKenna College, Heather MacDonald, Henry Yang, Immigration and Customs Enforcement, Middlebury University, Mike Pence, Movimiento Estudiantil Chicanx de Aztlán (MEChA), Natalia Spiegel, Northwestern University, Stony Brook University, students, The Bell Curve, University of California at Santa Barbara, University of Notre Dame. Bookmark the permalink.